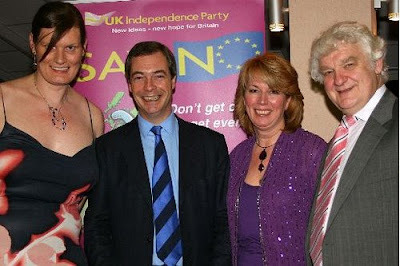 Enjoying the event, from left to right: Nikki Sinclaire MEP, UKIP leader Nigel Farage MEP, Jill Seymour & Mike Natrass MEP. On February 20th this year UKIP in the West Midlands held a dinner at the Tally Ho Conference Centre in Edgbaston, Birmingham, for a fund raising event. It was so successful and extremely well attended that the West Midlands UKIP Committee has decided to hold another one on Friday 25th September, 2009. This is following the enormous victory in the European elections and by way of a celebration for our success of getting two UKIP MEP’s elected and to thank our UKIP activists for all the hard work they have put in and for all that they helped to achieve. This time the UKIP Party Chairman, Paul Nuttall, will be joining those present. The Tickets will be £25 each and numbered. So, to ensure you won't be disappointed due to what will be a high demand for tickets, we recommend you book as soon as possible. Please make cheques payable to: “UKIP West Midlands” and send to: UKIP, c/o Holly Cottage, 30 The Fields, Kynnersley, Telford, Shropshire, TF6 6ED. PLEASE ENSURE YOU PROVIDE YOUR ADDRESS FOR TICKET TO BE FORWARDED - ALSO IF YOU WISH TO OPT FOR THE VEGETARIAN MEAL. If you need to know anymore contact Derek Bennett: ukip-derek@hotmail.co.uk or telephone: 07813 153897. DON’T FORGET, THE DINNER DATE IS FRIDAY 25th SEPTEMBER 2009, IT WILL BE AN EVENT NOT TO BE MISSED. The West Midlands did very well in the European Election. The Clubber very much approves of the activity and hard work of those involved like Derek Bennett and Josh O'Nyons. UKIP did very well in the European Union Elections 2009. But lets start campaigning now for the General Election 2010. That's the big one !